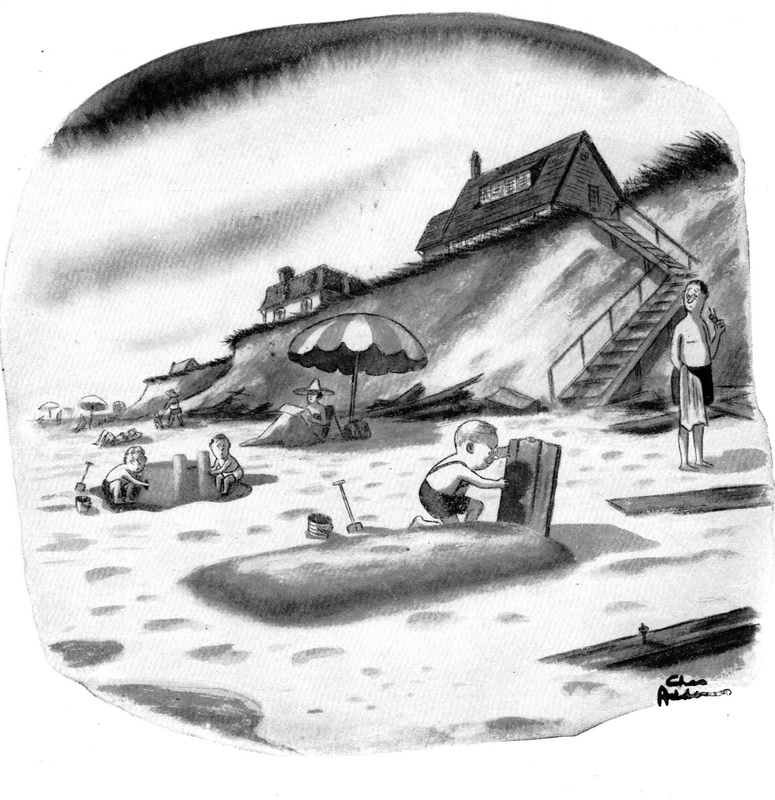 In addition to being a bon vivant, ladykiller, and sports car enthusiast, cartoonist Charles Addams was also a thief. He stole from himself.
. Five years later Addams, when painting a mural for a resort on Long Island (to date, the largest evermade by a New Yorker cartoonist)*, repurposed the gag. Or, as it is called in the trade: he “swiped”. Plenty of differences emerge when comparing the two images: the expression and attire of the child (later to be known as “Pugsley”) — more sadistically cheerful in the first image, more innocent in the second — as well as his position relative to the burial mound. The entire landscape recedes to a similar vanishing point, but while the 1947 beach is situated at the foot of a bluff, the 1952 environment is more dune-like. Where several houses peek out above the grass in 1947, only the Addams’ Family gothic beach house towers in the 1952 version. A key similarity, however, is the presence of the drab Normals who often populate the drawings of Charles Addams, reacting with fear and discomfort as the clan goes about their daily macabre lives. On the left, two little-boy Normals, with their normal sand castle and normal swim trunks, gaze in mid-construction. The Normal man on the right has to take off his sunglasses to get a better look at the grisly situation. These onlooking denizens, often chunky, frumpy, and always pale-white, are decidedly not us, but they are necessary abettors in Addams’ scheme to highjack erudite readers over to the Addams Family side of the fence of dark skullduggery. Part of the pleasure in absorbing an Addams gag comes from momentarily aligning ourselves with murderous children, matricidal spouses, and larcenous misanthropes while the clueless bourgeoisie within the cartoons stand by with slack jaws not getting what we get. Without any Normal beachcomber, little boys, or sandcastles to feel superior to, viewers are reduced to becoming Normals, themselves, and the gag sags. * Michael Maslin, cartoonist and King of New Yorker Cartooning Trivia, reports that there is actually a mural LARGER than the Addams masterpiece...by the great Saul Steinberg. If you are into New Yorker cartoons, Maslin's website is the epicenter of related data on the subject. CLICK HERE.